The fifth Ysselmeercontest will be held on Saturday 14 june. This contest will aim on contacts on the higher microwave bands. This year the contest will be held on 10 24 47 and 76 GHz. Also this year wed like to organise an Ysselmeercontest. This contest is basically ment to give microwave amateurs in the Netherlands and its adjacent countries a perfect challenge to test their microwave equipment. The contest is concentrated around the beautiful Ysselmeer, which is located in the centre of the Netherlands. The Ysselmeer ensures good microwave sites with excellent take off to many directions. The different locations are perfect for most microwave contacts within reachable distance and will give good opportunities for 24 GHz and higher. This year wed like to experiment with the rover phenomenon. That means that wed like to extend the duration of the contest with one hour to give stations the opportunity to move to a diferent location. For instance: you are situated at location A. You work as many stations as you can, specifically at the higher microwave bands. After three hours of operation you move to location B, possibly somewhat further away or in a different QTH locator with respect to some mmwave hams you worked before. The idea is that from this new location you may work any station again as if it were a newly worked station. So all uniquely worked stations count, even if you work them twice (from a different location, holds for both sides and for all stations participating, off course). This way you can optimally test your station: first from a nearby location, then from a more remote QTH. PAoEHG or PA0HRK for further information. Please state your name and callsign, expected QTH locator and gsm number. 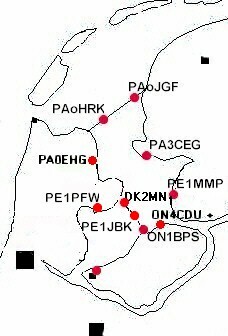 Consult the website of Hans, PA0EHG, for locations used in the past. Home stations are encouraged to make contacts but cannot win this contest. They may concentrate to work different locators or greater distances. Time for the contest : 10.00 until 17.00 hrs local time. It is suggested to move after three hours of operation but this is voluntarily. All contacts made after 14.00 hrs local count again, whether youre moved or not. Talkback frequency on 432.350 MHz or gsm/cell phone. Exchange: Callsign, band, RST and locator, in the log also the time and distance must be added; logs should be sent to PA0EHG within one week after contest. Each band has a winner when three or more logs per band received. Points are calculated by the sum of total QRB on each band.